Transfer Pipettes | Tamar Laboratory Supplies LTD.
Our range includes a large variety of transfer pipettes for safe and convenient application when transferring liquids in laboratories. 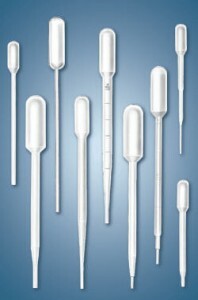 The disposable Pasteur pipettes are suited for versatile application without any risk of injury or infection from broken glass.As single-use products, the pipettes safely prevent carry over or cross contamination.The practical graduations are ideally suited for sample measurement and transfer. The pipettes can be heat-sealed to store residual volumes.For a sterile transfer of liquids, our range includes sterile options either individually wrapped or 10 pipettes per pack.The polyethylene material is environmentally neutral thereby ensuring non-toxic disposal.